The Record Store certainly was the main event of the month April and few really great singles were released on that day. Here comes, what else we thought was smashing. The Canadian band Spoons are celebrating the 30th anniversary of "Nova Heart", their third single release. 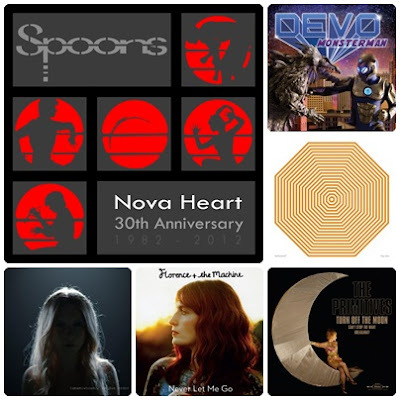 "Nova Heart 2012" includes the original and live version of the song, as well as two remix versions. Florence and The Machine released the fourth single from the album 'Ceremonials' entitled "Never Let Me Go". As already reported, the Primitives have returned with a new album this year and their new indie-pop jam is called "Turn off The Moon", our single of the month. Devo have released their first single since "Fresh" in 2010. The new song is "Monster Man" and it was recorded as a theme song for 'Monster Man', a show on the SyFy network about one of Hollywood's most respected monster prop building workshops. iamamiwhoami has released another two singles during this month, "Idle Talk" and "In Due Order". Singer's face slowly showing on the single covers. Last but not least, Spiritualized have returned with their first album and single in four years, both out this month. Their latest single is called "Hey Jane", don't miss the video for that.